I was inspired to make some pictures of phyllotaxis with primes colored in by this post at Maxwell's Demon, which has not only nice pictures, but also explanations for why the primes appear to line up on certain curves. Like the spirals there, the ones in these pictures are not numbered in the "naturally" occurring way - in a phyllotaxis spiral that occurs in nature (as in a sunflower or pine-cone) the outer dots/seeds grow first and are pushed out by the younger seeds that emerge from the center. It is a lot easier to simulate a phyllotaxis spiral as a function of the radius (described here) rather than modeling the pushing-out from the center that happens in plants (a good description of this is found in The Book of Numbers by Conway and Guy). Drawing number spirals with primes on them is some sort of recreational mathematics meme - the ulam spiral is the most famous, they are also drawn on quadratic spirals and others. 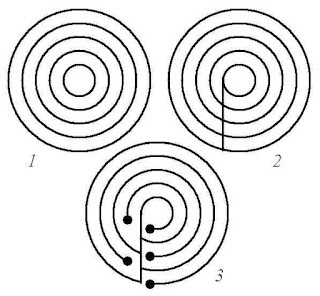 A while back there was a post that mentioned one way to draw labyrinths (via the method pictured above). Here's another way. For this second method, you can use some square graph paper, and start with drawing an axis that has two units in each direction (you might call these 4 radial spokes). From the end of each axis you draw a path as pictured below, extending the end of each axis in an alternating fashion. If you want, you can finish off the labyrinth by extending the path you drew in step 4 down to the bottom of the grid (step 5). Once you see the alternating pattern for extending the end of each axis, you can try without the grid, and might find that the free-hand version looks nicer. 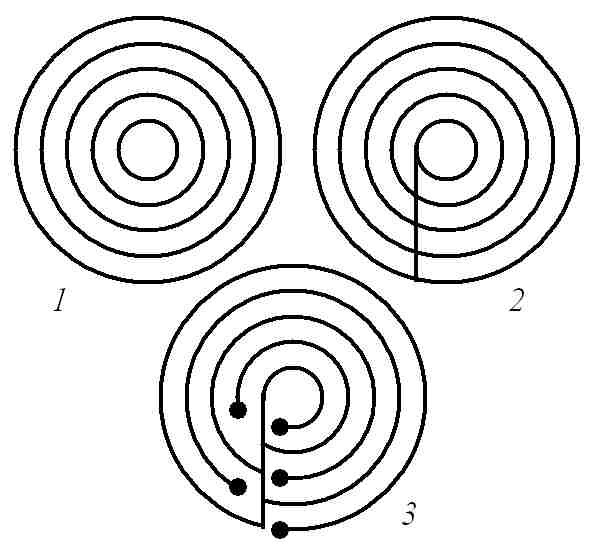 If you wanted to extend this process to make larger labyrinths, you would need to start with more radial spokes (this example used four radial spokes - can you do it with three, or with five?). If you'd like to have a labyrinth that brings you back to the beginning, instead of leaving you stranded in the middle, you can draw a curve through center of the labyrinth's path - you go in on one side of this new curve, and out on the other. A while ago I posted about how the traditional origami envelope could make a good object for simple math investigations. You can find instructions for the envelope on Origami USA's website. Like I mentioned, there are a lot of nice aspects to the envelope, such as the shapes in its crease pattern and its rotational symmetry. One thing to look at is the relationship between the size of the envelope and the paper you start with. It turns out that there is a nice relationship between the interior rectangle in the crease pattern and original paper (the area of the front/back of the envelope is just this rectangle with two of its corners trimmed off). Following the folds, subtracting and adding from some lengths what you deduce from other folds leads to some slightly intimidating looking expressions. Thankfully, these simplify down to what I found to be a surprising result. The interior rectangle has an area equal to one quarter the area of the original rectangle. More surprising to me was that each side of the smaller rectangle depended only on one of the sides of the original - the longer side of the interior rectangle is 1/sqrt(2) of the shorter original side, and the shorter side of the interior rectangle is 1/(2sqrt(2)) of the longer original. I'm sure there are probably easier ways to see this relationship. If you construct it in GSP or other dynamic geometry package you can experiment easily with increasing the side lengths. "The essence of mathematics resides in its freedom." I’d re-learned maths myself as a kind of tourist or traveller. Instead of the disconnected and seemingly arbitrary techniques I’d studied in the odd moments between recess and leaf collecting and dinosaur books, I found maths a unified country, sober and dazzling, when I returned to it as an adult. A literary example of using mathematics as a means of hanging on to sanity (unsuccessfully) under imprisonment (and torture) is found in George Orwell's 1984. In 1984, Winston Smith clings to the one truth that he feels cannot be unmade, that 2 + 2 = 4.